The warm, pink glow at Duc's Bistro makes everything seem rosy, lending an air of romance to the Manhattan atmosphere. White tablecloths, a grand piano, and a colorful bar complete the picture at this classy, but casual, French-Vietnamese restaurant. Duc's (rhymes with books) in Chinatown has been pleasing customers since 1991, says Duc, the friendly, personable owner, who is one of the many reasons Duc's Bistro has such a loyal following. Every hour is happy at Duc's Bistro. When you come in, we're happy! Extensive list, all selections available by the glass as well. Grand piano music every week - schedule varies. The restaurant seats up to 80 guests and is divided into two dining rooms with the bar in the middle. Perfect for any occasion. in the parking lot across the street. All Major Credit Cards, incl. Diner's Club and JCB. "Quietly elegant, the restaurant has an edgy chic more like Manhattan than Honolulu, and the food is beautifully prepared and presented. Sauces for the meats hint of Grand Marnier, Bordeaux, VSOP cognac, Pernod, and fresh herbs and vegetables. From the seafood spring rolls with shrimp, taro, and mushrooms, to the Meal in a Bowl (rice noodles heaped with fresh herbs and julienned vegetables, topped with lime dressing -- excellent! ), creative touches abound." 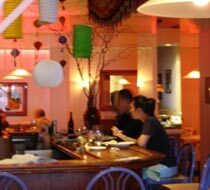 "Steadfast in its excellence, Duc's offers a romantic ambience, along with attentive service, and wonderful food that revels in its French and Vietnamese heritage. Classic preparation recommends such dishes as steak au poivre, duck breast, tarragon-laced prawns, or broiled lamb. Pastas, chicken, and sauteed or broiled fish can also be had. Plus, you'll want to sample the pastry chef's skills with a delicate, homemade confection and take advantage of the restaurant's outstanding wine list." "...a dozen New Zealand oysters on the half shell and a plate of buttery escargot Chablisienne ... these simple indulgences were prepared perfectly. Duc gave us an approving nod when we decided to try a special of Kobe beef tartare. Again, appropriate seasonings partnered with the unctuous, raw chopped beef mingling into a melt-in-your-mouth dish. These three classics were a tour-de-force of starters. They injected newfound meaning into the word, igniting passion for whatever followed next. We agreed that the trio could have been a completely satisfying meal if it had stopped right then. Duck supreme Grand Marnier was tart with Valencia orange slices. Rack of lamb, accompanied by gorgeous mashed potatoes, had two bones per chop in a Bordeaux-Chivry sauce. Filet of bass nonpareil was the plate into which all of us tried to get our forks. Nonpareil Spanish capers sprinkling the dish were the biggest we had ever seen. Without dominating, they added a perky bite to the delicate lemon-butter sauce blanketing the tender, moist white fish. Dessert here was the kind of affair that stretches out the lingering notes of a good meal. At Duc's Bistro, day or night, it's about the ambience, which calls you back like a past lover."